Finnish crane manufacturer Konecranes recently rolled out what they claim to be the first hybrid reach stacker for container handling in the world which features a diesel/electric driveline. The SMV 4531 TB5 HLT crane has a lifting capacity of 45 tonnes and comes with an electrified hydraulic lifting system as well as a super capacitor based energy storage. Konecranes believes its newest offering will cut fuel consumption and emissions while offering improved performance in terms of acceleration and lifting response. Estimated fuel consumption for the crane is said to be 10 litres per hour during normal handling of fully loaded containers, significantly less than conventional reach stackers. According to Konecranes, this can be achieved through the electrification of energy flows across the driveline, the hydraulic lifting system and the energy storage system. Konecranes Lift Trucks Technical Director Anders Nilsson explains that dedicated electric motors in the reach stacker which can be operated in regenerative mode powers propulsion and lifting. 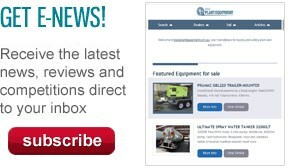 "The energy generated from braking and load lowering is recovered and stored for later re-use which means a reduction in diesel fuel consumption and environmental impact," he says. "Meanwhile, productivity is increased in terms of quicker response and higher acceleration." The new reach stacker is still undergoing field testing at Port of Helsingborg, a port situated at the narrowest point of the sound between Sweden and Denmark. 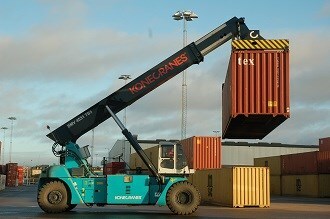 Konecranes has not released information on the arrival of the reach stackers in Australia.